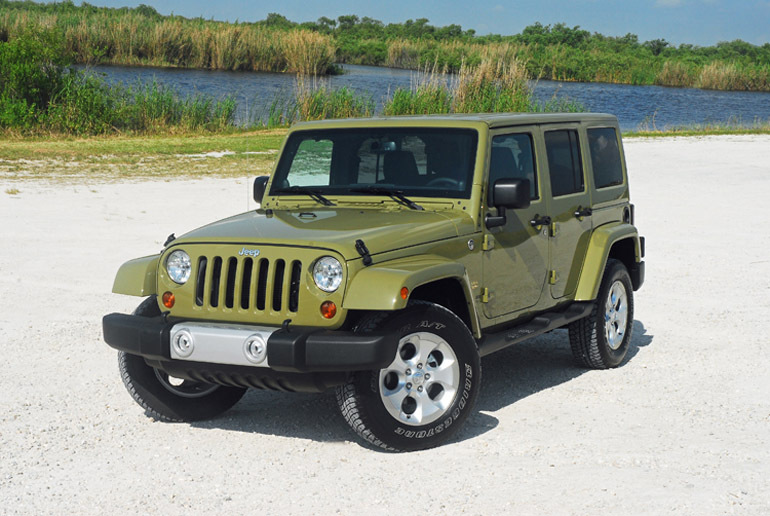 The new 2013 Jeep Wrangler four door Unlimited Sahara is for the adventurous family looking for fun and adventure off the beaten path. While the body style retains the same iconic look, the interior keeps getting more comfortable, ergonomic and connected while the mechanicals under the skin gets updated with the latest 4X4 drivetrain. 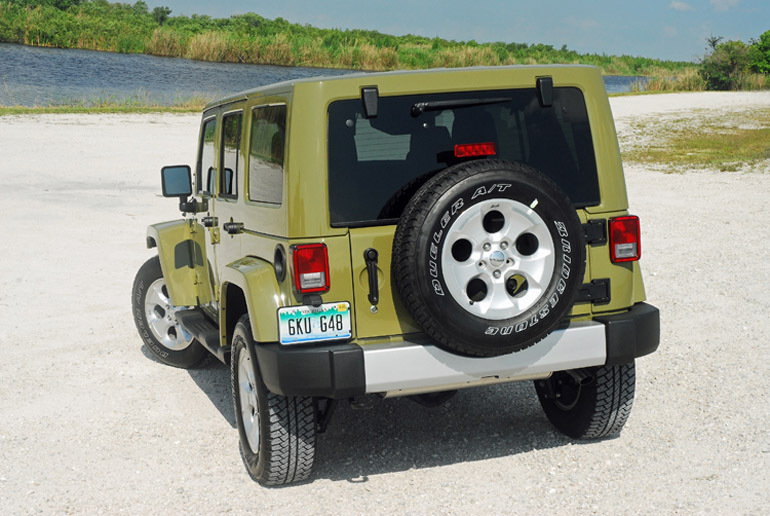 New for the 2013 model year Unlimited Sahara includes new front and rear seats that are re-contoured with larger side bolsters offering more comfort for long drives and more support for sporting off-road activities. 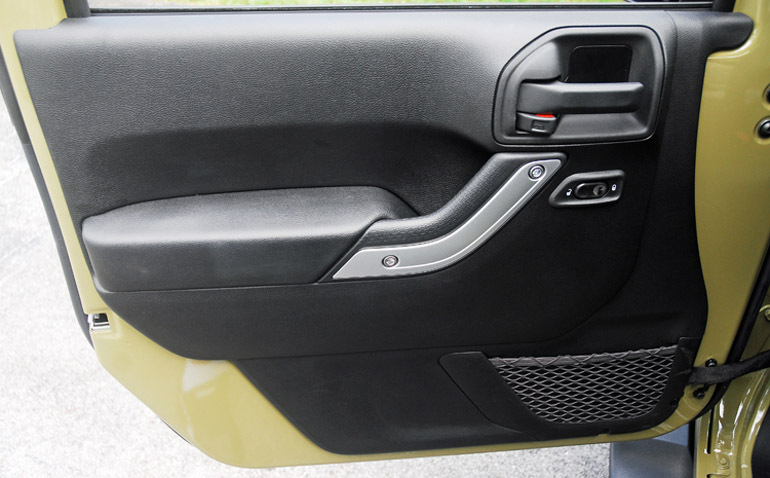 There is also a new release handle for the rear seat fold-down function that only needs one hand for greater convenience. The interior courtesy lighting is now found under the instrument panel as well as the cup holder areas for front and rear passengers. An auto-dimming electro-chromatic rearview mirror is standard and features LED map lights up front. A new Alpine premium speaker system is standard. The optional navigation system features a 6.5 inch touch screen display. My test model came equipped with the three-piece hard top but new for 2013 is a revised soft top that is easier to raise and lower, especially when operated by one person. Also new this year is new wheels-18X8 inch five-hole alloy wheels with a polished lip and sparkle silver paint inner face. These new stunning wheels are wrapped with 255/70R18 inch Bridgestone Dueler tires and each wheel also features a stenciled ‘Wrangler’ silhouette graphic in gray. My test model came covered in the new Commando Green paint scheme which really got positive remarks from other drivers. All Wranglers now feature dual windshield washer nozzels to help better clear away mud and dirt from the windshield. 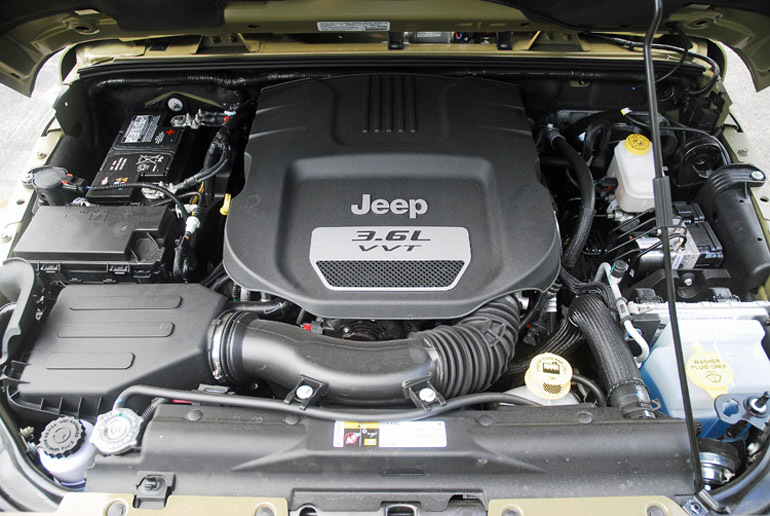 Powering the new Jeep Wrangler Unlimited Sahara 4X4 is a 3.6 liter DOHC all-aluminum V6 engine that generates 285hp at 6,400rpm and 260lb.ft. of torque at 4,800rpm. That’s plenty of power and torque to easily conquer any off-road obstacle. This V6 is more efficient and can give 21mpg on the highway. A six-speed manual transmission comes standard but my test Wrangler came with the W5A580 five-speed OD automatic transmission with the Command Trac NV241 two-speed transfer case features a 2.72:1 low-range gear ratio. In addition, an optional Trac-Lok limited-slip rear differential provides extra torque and grip in low-traction situations such as sand, mud or snow. 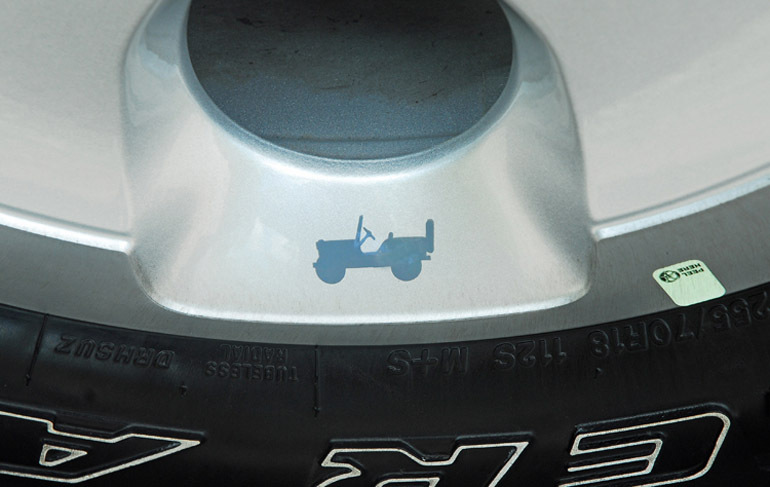 You get 2WD, 4WD High, Neutral, and 4WD Low for your choice when off-road or on-road. 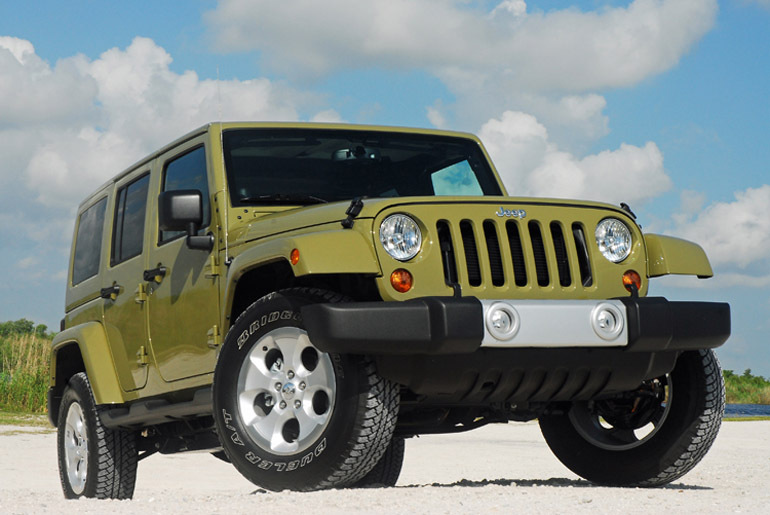 The 2013 Jeep Wrangler Unlimited Sahara 4X4 delivers unmatched off-road capability with legendary four-wheel drive and is produced with more than seven decades of 4X4 engineering experience. Wrangler continues to offer a body-on-frame design with a front/rear five-link suspension system, live axles, electronic lockers. Up front is a live axle with link coil, leading arms, track bar, coil springs, stabilizer bar and mono-tube high-pressure gas shocks. The rear features a live axle, link coil, trailing arms, track bar, coil springs, stabilizer bar and mono-tube high-pressure gas shocks. The Wrangler is available with several axle gear ratios allowing customers to optimize fuel economy and/or vehicle capability. Wrangler is available with 3.21, 3.73 or 4.10 ratios depending on model. Wrangler can tow up to 3,500 pounds. My test Wrangler came with the 3.21 axle ratio. A best-in-class approach angle of 44.3 degrees, Breakover angle of 25.5 degrees and a departure angle of 40.4 degrees help the Jeep Wrangler scale the toughest terrain. The capable driveline of the Sahara model includes a Next Generation Dana 30 front axle and a Next Generation Dana 44 rear axle. The power re-circulating ball with damper steering system is great when on-road or off-road. You get quick response to your inputs whether off-road or on-road with a great feel for the different terrain you may be driving on. 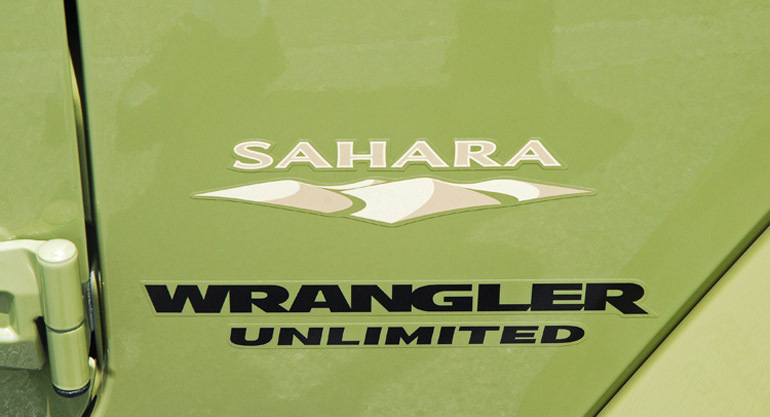 Slowing the new Wrangler Unlimited Sahara 4X4 down from speed or when traversing off-road are large, power-assisted steel disc brakes. Up front are 11.9 inch vented discs and 11.9 inch vented discs in the rear. Each disc is clamped with large single-piston calipers. Giving you extra control is standard ABS, Hill Start Assist, Electronic Stability Control, Traction Control and Trailer Sway Damping. The interior combines rich styling, versatility, comfort and intuitive feature use. Highlights in the Unlimited Sahara include automatic temperature control, heated premium front leather seats, power/heated sideview mirrors, tilting/leather-wrapped steering wheel with control for vehicle systems, power windows with front express down, power door locks, rallye style instrument cluster with chrome bezels and compass/outside temperature readouts plus trip computer readouts including a tire pressure monitor showing the psi of each wheel, U-Connect 130 CD/MP3 player, audio jack input for a mobile device, 115-volt auxiliary power outlet, driver-seat height adjustment, front dome with on-off switch, cruise-control, variable-speed wipers/washers/rear wiper/washer. 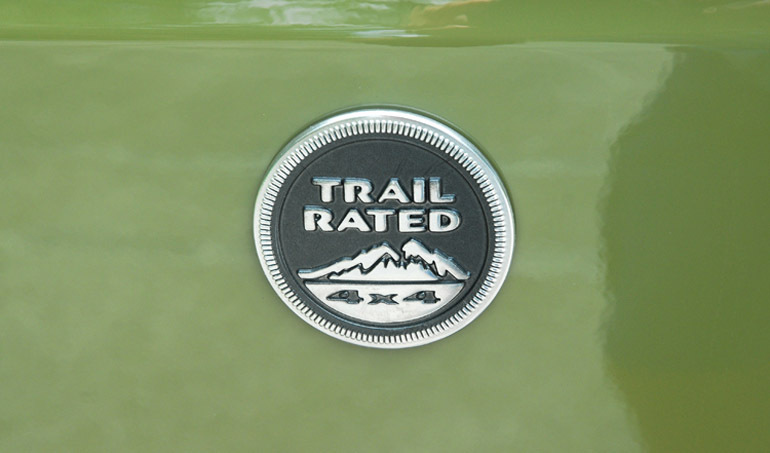 Standard exterior features include Trail Rated badge, deep tint sunscreen windows, black rectangular running boards with black diamond plate non-skid, two front/one rear tow hooks, automatic headlights, and foglamps. 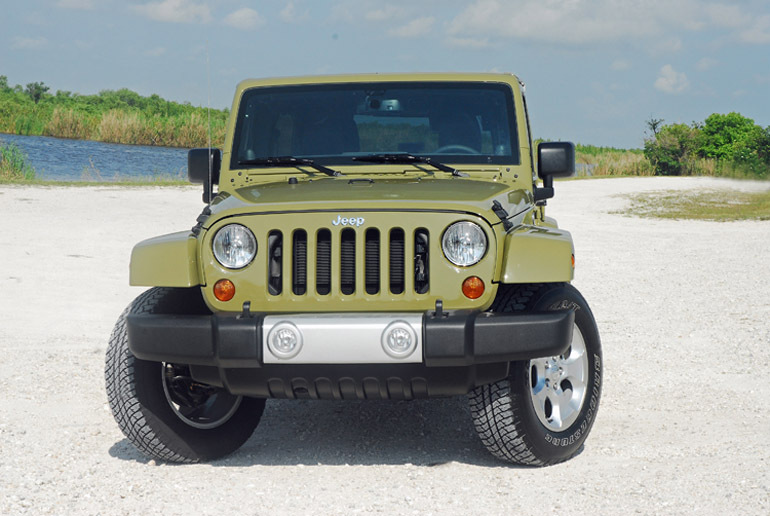 Jeep Wrangler signature styling includes a the classic round headlamps, seven-slot grille, trapezoid wheel flares, removable doors, exposed hinges, a fold-down windshield and innovative and convertible tops and half doors that allow the Wrangler to retain the brand’s iconic appearance and function. 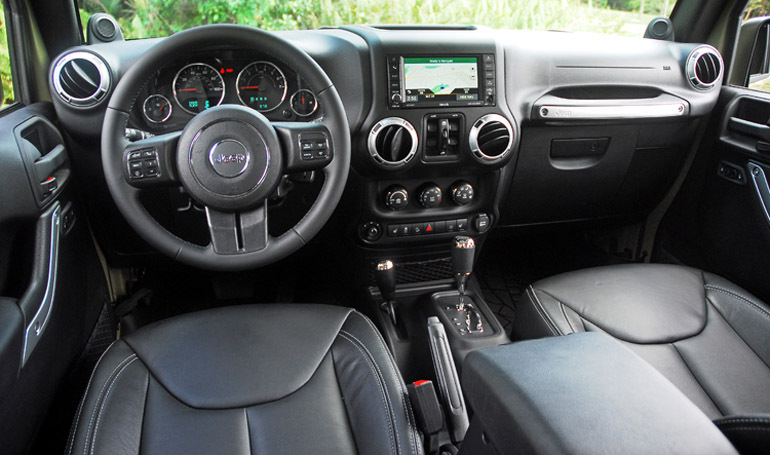 With room for five adults, the Jeep Wrangler Unlimited Sahara 4X4 four-door is the only 4X4 convertible on the market. You stand connected with U-Connect systems including voice recognition, Bluetooth streaming audio, navigation and Sirius satellite radio. All controls are within your fingertips. Standard safety features not mentioned above include advanced multi-stage front airbags, electronic roll mitigation, Sentry Key theft deterrent system, security alarm, transfer case skid plate, and a fuel tank skid plate shield. Options not mentioned above includes a 40 GB hard drive with 28 GB available, remote start system, rear window defroster, and slush mats by MOPAR. 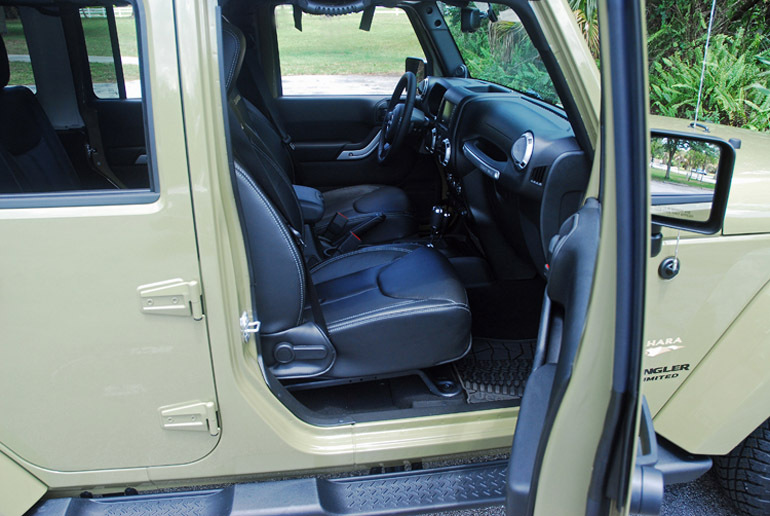 The new 2013 Jeep Wrangler Unlimited Sahara 4X4 dour-door is the best off-road adventure vehicle for the whole family, or just a single or couple who loves the great outdoors. This new model is more modern on the inside and under the skin to give you more of what you are looking for in a genuine off-road warrior. 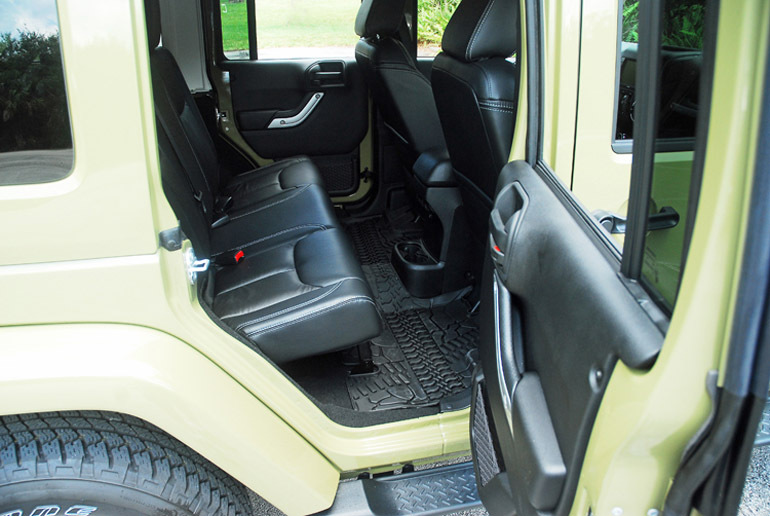 Cargo volume: rear seat folded-70.6/rear seat upright-31.5 cu.ft.